Jillian here. Today March 9 and a Saturday. Yay. This past week was crazy busy. Court for three days and one was an important trial and so I was very ready for the weekend. I DID get to take part of the day off on Tuesday. I have a friend who lives in Indiana who is a charter bus driver. She brought a bus load of basketball players down near this area. She drives down and then hands the bus off to another driver as they are limited to the hours they can drive. She gets a rental car and so she visited a number of people she knows in the panhandle area. We took a ride out to our local lighthouse and had a seafood lunch. Lots of fun. And it was awesome to spend a few hours with her in a stress filled week. Today, the husband and I went to an architectural salvage place about 50 miles from us (outside Mobile, Alabama). It’s very cool. I was looking for an old door to make a table from but eventually decided (they have 7 barns full of stuff) on a piece of iron to build the table around. It’ll be in the center. The guy there repurposes a lot of stuff into unique furniture and he had some he’d done with the wrought iron so I chose to go that route. I also got a small table to paint and add a chunk of granite that was left over from my new kitchen counters. It’ll be a side table. And I got a carved teak candleholder that weighs a ton. Here are some photos. Jillian here. I was working on an upcoming blog post for a friend for the month of October which is apparently Family History Month. My post for then is about my two great aunts. One of which I knew well and one who died before I was born. It reminded me of a funny event involving the one I knew and I thought I’d share it for my post here this month. My family is from North Alabama. Even though I never lived there, we visited a lot. My great aunt Lit was my paternal grandfather’s sister. She was married to a man named Charlie Sandlin and I loved, loved him- her, too, but her husband was my pal as a kid. My grandparents owned a house on the Tennessee River and Uncle Charlie and I would swim the mile and a half across it all the time- we’d try to touch bottom way out in the middle. Sometimes we could and lots of times, we couldn’t. The Wilson Dam was not too far away and the water levels rose and fell as the dam was used to let boats in and out of the lock. It was always deep in the center, but sometimes, near shore, you could walk out a number of feet and pick up stray clams in the mud. All the kids grabbed them a lot and then we’d put them in steaming water to see them open. Charlie was a big ole kid and we had a special bond. Uncle Charlie had a brother named Buddy and he was an inventor. It was a lot of fun to see him on occasion- usually running into him at a store or something like that. He didn’t come out to the lake house and I didn’t know him well and never met any of his kids or grandkids. Years later, after Uncle Charlie died, I was in law school in Birmingham, Alabama and met a guy in one of my classes named Jimmy Sandlin. I couldn’t resist asking him if he was from Florence, Ala. He said he was and I told him I had a great aunt named Lit who married a man named Charlie Sandlin and he had a brother named Buddy. I asked if he knew them. Man! Did I feel silly, but you know what? In all my life, I’d never heard her called anything but Lit. The next day, I told my new friend we did indeed share a great aunt and, from then on, we called ourselves cousins-in-law. How about you? Any stories about mistaken identity? Here’s a picture of the two great aunts I’ll be on my friend’s blog talking about in October. Lit is the one in the seat and Hoovey (another one with a nickname as her real name was Louise) is the one on the arm of the chair. 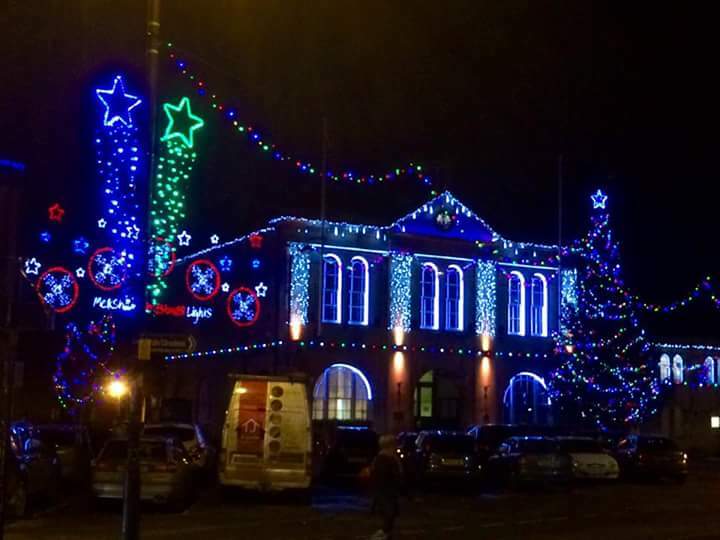 I thought I would send a photo of our local Christmas lights at the Town Hall. It doesn’t do the display justice as it is grand, colourful and leads through the whole of our main street and market place but it represents what a strong community I live in. All year the Christmas Lights Team work long hours planning, preparing, repairing and generally getting ready for the big day – Switch On Day – usually first Saturday in December. The team are all volunteers giving freely of their time and expertise, a mix of ages and sexes but committed to providing a spectacular centrepiece for our town. Fundraising events, donations, food, entertainment all provided by volunteers and local businesses. During the day things start to build up with a Christmas Fair, Father Christmas visits too and last minute checks on equipment. Over the years the displays have become more sophisticated but so have costs such as insurance and equipment. The volunteers work tirelessly especially during the last few days. Their reward is seeing families, friends and visitors gather around the magnificent tree around 4.30pm in readiness for the big moment. A local child, often representing one of the local charities, is chosen to help the Mayor switch on. This year there are stunning special lighting effects which make the surrounding trees and buildings look magical. People come from miles away to visit and view the lights, donation boxes help fundraise for next year – forward planning here. Many of the shop keepers have individual trees lighted up on their shop fronts all adding to the magic. The lights stretch about half a mile through the town. Carol singing and cheering all add to the excitement. I am so proud to be part of this community but especially want to say the whole event demonstrates the power of people coming together for the greater good. Thank you to my Town. Special thanks too to my blog friends, you are an amazing group of talented people who have given support, love and encouragement to me across the miles. Merry Christmas to you all and your friends and families. When it came time to leave, my friend told me that she was going to clinch her new improved mood by singing her ‘happy song’ at the top of her voice while driving home. It was a song she’d learned in school, a silly little ditty that always made her feel happy. Do we all have one of those? A special song we spontaneously burst into when feeling good, or when we want to improve our mood? I do, and here it is. Do you have one? Atlanta, RT and Booker T.
Jillian here. I just got back from Atlanta, Ga where I attended the Romantic Times Convention. The convention itself was fun and it was good to see other writer friends as well as chat and interact with readers. I had two pretty awesome things happen in the reader arena – with the same book. I wrote a story called Rex, the Ex and the Hex– first draft was done in 12 days – it was such a fun story to write as the hero believes himself to be hexed and visits a number of hoo-doo folks to try to get rid of the hex (like a witch doctor, a haruspex, a tarot reader, etc). One reader mentioned she read it and thought it was really good and she could tell I was having a blast as I wrote it. That made me happy as I was glad that shone through. Another reader saw the cover on a magnet on my table at the signing. She grabbed it and said, “You wrote that?” When I said yes, she said, “I loved it so much, I read it twice and I never do that.” – Her words were worth the trip to Atlanta for me. Well, these days, he travels with his son and two other guys. The music is still wonderful. He and his son played a ballad version of Purple Rain by Prince and it was so moving it brought me to tears. We got a chance to chat with him in the lobby afterward. What a nice, humble, kind man he was. I could’ve stayed there all night. It was that amazing. If you get a chance to go, do! here’s one famous song and another with his son on guitar. I tried to upload one of the videos I made but for some reason, the computer said no. We were seated right by the piano. It was awesome. When they actually can hear you scream! Okay, so November has sort of passed in a blur that is NaNoWriMo, but happy to say the end is now in sight and on the home run. Yay! I’ve thoroughly enjoyed the experience of NaNo and it seems to have had the desired effect of getting me back into the writing mindset. The story has absorbed me, and the best part of all, I’m enjoying writing again. But November hasn’t been all work and I’ve made time for some fun along the way. Every month a nearby town holds a community theatre and movie night, which has turned into a girls’ night out. We four do the whole thing: popcorn, wine (for those who aren’t driving), ice cream and a shared box of chocolates. Last night’s movie was Me Before You which was really excellent. I haven’t read the book (being a happy-ending kinda gal) but absolutely loved the movie. Excellent acting, a good story, and although a sad ending it wasn’t mawkish. Highly recommended for those who might not have seen it. The play was the stage adaptation of the movie of the same name and is based on Susan Hill’s story of a lawyer obsessed with a curse he believes has been cast on him. In the stage play, he employs an actor to help him exorcise his demons, but soon what is real and what is make-believe begin to blur with spine-tingling results. One British newspaper gave the play five stars and said: “The atmosphere is so charged up that on more than one occasion, the entire audience screamed in terror” Well, I read that with a little scoff…until I actually did. The play was spooky and I lost count of the number of times I jumped out of my skin. It was incredibly well acted, with excellent sound effects and visual aids. During one loud and blood-curdling scream which seemed to come from right behind us, we all instinctively grabbed for each other and yes, actually screamed right back. Since most of the audience were engaged in a kind of hushed nervous laughter, I don’t think we were alone in that. So, two hours later we emerged, a little shell shocked and with the chocolates still in their unwrapped state. Testament indeed to a good night had by all. It’s ladies’ night! Oh what a night! Last month I invited the ladies from the office over for a little dinner and some poker. I expected it to be a good night. I expected us to have a couple hours of playing cards, eating, and talking. I expected everyone to have a good time. It was a great night! It was several hours of non-stop laughter and shenanigans! And everyone had a fantastic time! Oh my! Put five ladies in a room together, add a deck of cards, some poker chips, food, snacks, wine, and dessert [and a charming male who makes intermittent appearances throughout the evening] and you have the recipe for an exceptional evening! We ate. We played poker. We ate again. We played poker. We ate again. We played more poker. We talked about everything under the sun, laughed at ourselves, discussed work for perhaps 30 seconds, and then went straight into carrying on again. Did I mention we played poker and ate? It’s good to get together and get away from the stress of the job, the worries of the family, and just relax and laugh and share…and be with other women who understand that we all need to escape once in a while, let our hair down, and be completely at ease being who we are individually. The time passed so quickly that evening, but oh my how fun it was to be there in the midst of it all as one of the gals! Until next time, may you gather your friends together, laugh until the cows come home, and play a little poker!